It has been pointed out to me…. That I really should pay more attention to my blog. I currently hit it in fits and starts…partly because I get busy and have little time to post, partly because the only computer at home is my husband’s and he’s a student, and partly because I feel like my pics are so bad that I have no right to be putting them anywhere. 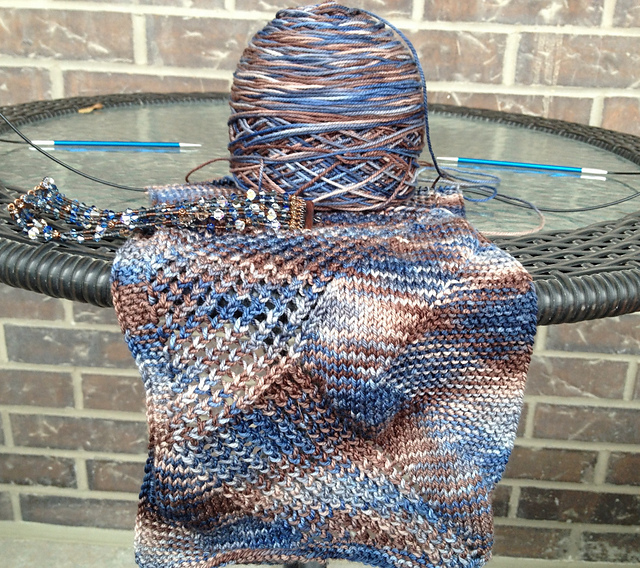 It’s been a busy autumn…where by busy I mean that I spent a lot of time knitting. Not sure why I don’t feel like I have the FOs to show for it. I am knitting a lot of socks that I am giving away, which is completely new for me. More on that later. I have completed 12 pairs of socks this year, which upon counting and discovering that, I will admit to being a touch shocked. One of those pairs was a test/sample knit for Kate Atherley, over at Wise Hilda Knits, one of my favourite sock designers. Those need to be their own FO post. Another thing I have put some time into and have hit the 50% point on is the scarf I mentioned in October. It’s as awesome as I thought it would be and frankly, if I wasn’t trying to finish up a few things before Christmas, it would be done by now. I cannot wait for this to be done!! This past weekend I spent a huge amount of time either brunching or hanging out in yarn shops. (What? Both are completely valid lifestyle choices.) Lovely visits to Eweknit and The Purple Purl with my friend Shireen netted both Christmas gifts for others and belated birthday gifts for me. Speaking of Christmas gifts, I am looking forward to Christmas in Newfoundland, which we do every second year. We won’t be decorating or anything, as hubby is in his very last set of final exams and I really can’t be bothering him to help me do things right now. As a result, to put me somewhat in the spirit, I have been trying to find a good gingerbread recipe. Last night’s was a spectacular failure (my fault, not the recipe’s!) and a teensy bit too gingery for me, I think. Half a cup of real ginger and no cinnamon or cloves wasn’t really the taste I was after. So my search continues. Got one to share? This entry was posted in Uncategorized and tagged kate atherley, shireen, socks, stillwater, sweet georgia, zigzag wanderer by Rayna. Bookmark the permalink.